According to Wikipedia: “Orenthal James “O. 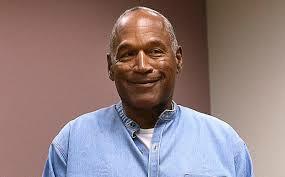 J.” Simpson (born July 9, 1947), nicknamed The Juice, is a former NFL running back, broadcaster, actor, advertising spokesman, and convicted armed robber and kidnapper, most well known for the trial in which he was found not guilty of murdering his ex-wife Nicole Brown-Simpson and her friend Ron Goldman. According to recent polls, the vast majority of Americans believe he is guilty of the murders… After retiring from football, he began new careers in acting and football broadcasting. In 1994, Simpson was arrested and charged with the murders of Nicole Brown Simpson, his former wife, and her friend Ron Goldman. He was acquitted after a lengthy and internationally publicized trial. The families of the victims filed a civil suit against him, and in 1997 a civil court awarded a $33.5 million judgment against Simpson for the victims’ wrongful deaths. In 2007, Simpson was arrested in Las Vegas, Nevada, and charged with the felonies of armed robbery and kidnapping. In 2008, he was convicted and sentenced to 33 years imprisonment, with a minimum of nine years without parole. He served his sentence at the Lovelock Correctional Center in Lovelock, Nevada. On July 20, 2017, Simpson was granted parole. He is scheduled to be released from prison on October 1, 2017”. I recall all those years ago following the O.J.Simpson trial for murder and being encapsulated. After his acquittal I lost track – until yesterday’s parole hearing. I hadn’t even realized he was in prison or know enough to have a rounded view on the sentence, which seemed excessive, especially as there are many examples of people doing far worse, and I wonder if this was because he got away with the murder charge. What was fascinating all those years ago was then we were witnessing a man that appeared to have everything, a major celebrity, full of confidence and bravado even, but when I watched him at the hearing he appeared to be broken. How the mighty have fallen but then brokenness often precedes restoration. I wish him well and hope when he is finally a free man he will live a fruitful life and make peace with any he has wronged.